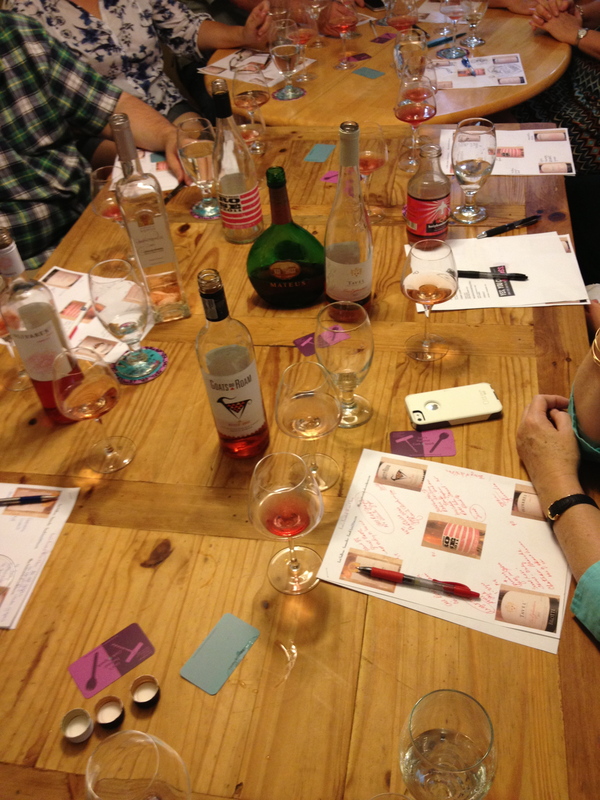 So I decided my mission for my Twisted Peeps Wine Class was to prove that rose’ is not what your Grandma or what your parent’s drank in the 1960’s & 1970’s a.k.a. …Mateus. Brotte “Les Eglantiers” from Tavel (Rhone region) France. Chateau de Berne “Impatience” from Cotes de Provence, France. Charles & Charles from Washington, USA. Goats do Roam from South Africa. The first rose’ the class tried was the Brotte. I knew this was going to get their attention because it was so balanced with light fruit and acidic minerality, not sweet at all. I love rose’ from Tavel. The class really perked up and got excited about trying the others. The third and the fave of the class was the Charles & Charles. Bright fresh stone fruits, watermelon and a zesty finish. I had to stop a few from pouring another glass before we got to the last 2 wines….things were getting out of hand and side conversations were getting very loud. Fun with rose’ was kicking in! The Goats do Roam was not a hit. Most said it was funky and rough to drink. I think it needed food. It was the most full-bodied wine out of the group. Our last rose’ was Olivares. The class liked this one. It was red fruits and spicy with an earthy finish. By this time, I had pretty much lost control of the class. It didn’t bother me too much because they were having a great time discovering wines that they thought would not be worth their time or money. So after the laughter stopped, we opened the Mateus and it was sweet grapes with some effervescence. A few people said…please don’t “bring it on home”!! This entry was posted in Sommelier Stuff and tagged Chateau de Berne, Herbes de Provence, hot Texas weather, The Goats do Roam, The Rose, Twisted Peeps. Bookmark the permalink.